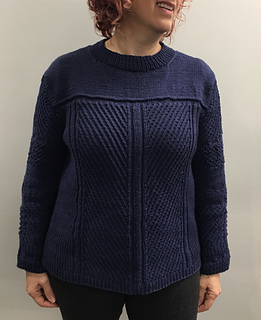 Vertical sections of stockinette, twisted traveling stitch and honeycomb pattern stitch alternate across the body and set-in sleeves of Patty Lyons’s pullover. The neck edge is ribbed in finishing. Sugar Bush Yarns’ Crisp provides excellent stitch definition.